Carolina Pride Pastures, LLC: Blog: Herd Health Day! After terrible cold and then rain this past week, it was a beautiful Sunday! The warm sun was a welcome for our herd health day. Weights and body scores were taken. A shot of Ivermicin was given and toes were trimmed. Fecals were taken as well. The barn was cleaned just in time for the girls to come in and dust to dirt it again!! As we enter the last trimester of their pregnancies, we have started Dr. Evans fiber supplement. I will be getting our calendar ready for boosters prior to birth. 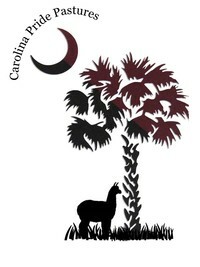 The next few months will be busy but we are awaiting the birth of 4 health and fiber rich crias!! !